What's in the Sky during April? Sky & Telescope senior editor Dennis DiCicco visited Stellarvue's facility in Auburn California.This 18 minute video takes you from prototyping a lens to producing a world class refractor. Watch on YouTube . We kicked off this month by having some fun with our 'April Fools' sale page. Even though we're extremely busy, there's always time for some fun at Stellarvue. In case you missed it click here for laughs. This link will soon disappear so don't wait too long! Vic was going to exhibit at NEAF this year but at the last moment he was called to serve on jury duty. So we cancelled our booth at NEAF this year. We hope to see our East Coast friends next year! We have already shipped several of these new models so far. 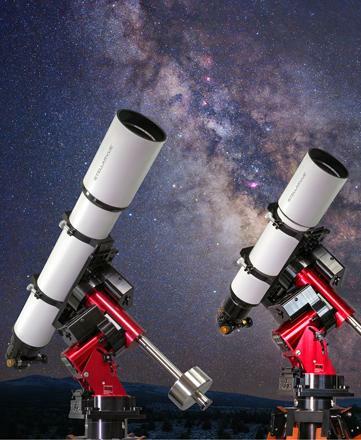 So many of our customers customized their SV152T with a Moonlite focuser that we partnered with Ron at Moonlight to make an imaging model of the telescope using this advanced focuser. This new version of the SVX152T will appear on our website next week. Watch for it. Our wait list on this unique telescope is nearly completed and another run of objectives are on the way. Order now for a Fall delivery. 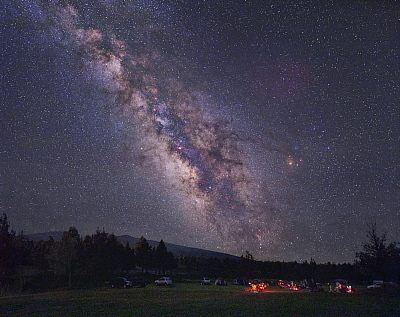 Stellarvue's Annual Dark Sky Star Party (DSSP), July 4-7, 2019. ﻿The population of Likely, California will again expand when we assemble at the tiny California town. DSSP is a benefit of ownership for people who observe and image with Stellarvue telescopes. It is a private event we sponsor specifically for our customers. We limit attendance to a total of 50 people. Right now we are holding a site for the weekend only (Friday and Saturday nights) and another full hookup site for all four days. These sites are being held for people who have never attended before. If you want to attend with your Stellarvue telescope email Vic! SV - What sparked your interest in astronomy? JT Back when I was around 9 or 10, I remember my cousin getting a refractor and mount from my uncle. I thought it was the coolest thing. I never did get to look through it but that memory was rekindled later in life when my kids started doing things on their own and I was looking for a hobby I could pursue myself. I bought some books and looked at the magazines, Sky and Telescope and Astronomy. I saw the neat pictures in the gallery section and the desire hit to be able to do the same thing. SV - Do you remember your first “ah-ha” moment; what were you looking at when that occurred? JT My first ah-ha moment was looking through a small 4” reflector I bought as sort of a first scope and seeing some faint galaxies through it in my backyard. Just the idea I could see them was amazing..
SV - What led you to the imaging side of astronomy? Do you have a background in photography? JT The imaging side of astronomy developed after about a year of just looking at stuff. My yard being in a suburban and rather light polluted location limited what I could see. I kept seeing the neat images in the astronomy books and magazines and thought I would try to take a picture. I did that using eyepiece projection and a point and shoot digital camera. Wow, I was hooked. SV - How long have you been imaging? JT I’ve been imaging since 2001 so 18 years. SV - What are you most proud of (astronomy/imaging) and why? JT I’m most proud of being able to image the night sky, even from home, and produce images nearly as deep and of close to the same quality as from a dark sky site. JT Here are some of my tips when pursuing imaging: First just try it with a typical DSLR camera on a tripod. There are many used and inexpensive DSLR’s on the market. Maybe try imaging the moon. You can do a lot of cool stuff in just a few 10’s of seconds and with a short focal length lens you can easily capture entire constellations and see the Milky Way, even from light polluted areas. Maybe after you get proficient with that, a small inexpensive tracking mount like a Vixen Polarie or I-optron sky tracker would open up other options for you. Second, if you decide this is cool and want to try taking pictures through a telescope, read as much as you can about astrophotography first. There are many resources on the web which help point one in the right direction. You will quickly realize that this hobby isn’t inexpensive once you get into the telescope and mount side of things but there are many decently priced systems out there to get you going. Whatever you do, don’t buy a telescope from a retail department store. 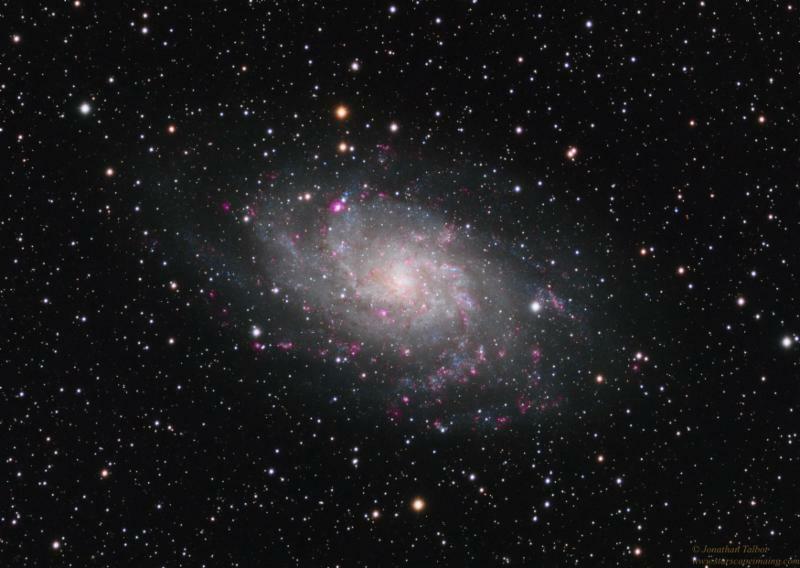 Go with a reputable company and try to find a small refractor (70-80 mm) and put it on the best mount you can afford. There are some amazing light weight mounts available today that when paired up with a small good quality refractor do a wonderful job. Camera? Keep the DSLR for a while and learn to image with it. One of the biggest mistakes you can make is jumping right in with a large telescope, not so stable mount and a ccd camera. You will quickly become frustrated with the complexity of it all. SV - How would you describe your passion about astronomy and the night sky? JT My passion for the night sky is second to none, especially the imaging side. I’m amazed at all that is around us and we are just a tiny speck of nothing in the grand scheme of things. Imaging has allowed me to experience just a bit of what’s out there and to share these images with others. SV - What continues to give you that rush? JT The challenge of getting things set up and seeing that first image download gives me a rush. SV - What do you love most about astronomy? JT The thing I love the most about astronomy is that, as a hobby, it can get you away from the drudgery of everyday life. It can give you your quiet space for a while and you can learn something at the same time. SV - What has surprised you the most about astronomy/imaging? JT The thing that surprised me the most about astro imaging, and continues to do so, is the complexity of getting everything working together perfectly. 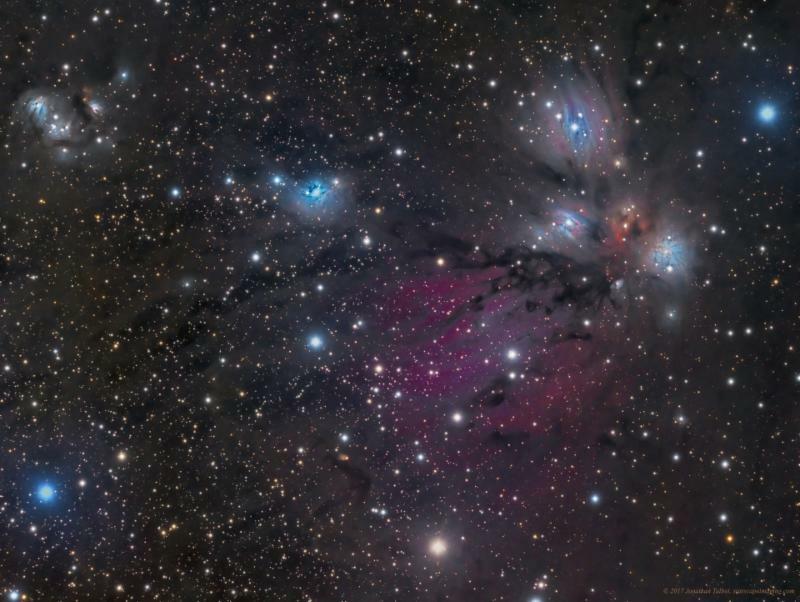 Whether it’s the software, your camera, mount, etc., astro imaging is not easy and many things can and will go wrong. 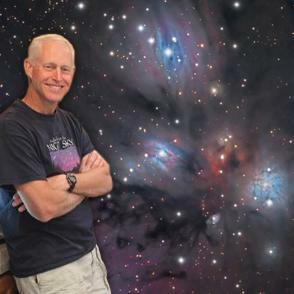 I enjoy challenges and astro imaging is definitely a challenge. Not only do you have to become proficient with your equipment, you also have to eventually become proficient processing the images you take and that’s a whole other side to the hobby. SV - Besides clear skies, what are the biggest challenges you face imaging? JT Besides clear skies the biggest challenge is getting all your equipment working harmoniously together. SV - What makes Stellarvue telescopes special to you; what advantages do you find when using them? JT The thing that makes Stellarvue special to me is two-fold. First it was the first telescope that I used to take my first decent images. It was an 80 mm Stellarvue Nighthawk, which I still have. It was a doublet and because of that had some false color but I was determined to figure out how to manage that and eventually started producing really nice images with it. Vic saw those and invited me out to the summer star party, in Hidden Lakes at the time, to talk about how I produced my images. That led to a great relationship with Vic and the Stellarvue family. Secondly, I realized early that Vic was an innovator and he was always looking at different ways to improve his scopes. Sometimes these ideas worked, other times they didn’t but these ideas led to the world class scopes Stellarvue produces today. I’m extremely proud to have been able to test just about every model of scope Stellarvue produced and give my feedback on how they worked for astrophotography. SV - Filling in the blank, how would you complete the following: Having the choice, I choose Stellarvue telescopes because _______. JT Having the choice, I choose Stellarvue telescopes because I understand the effort and dedication that goes into producing these telescopes. Whether it’s your first scope to visually look at the stars or one you purchased to produce a wonderful image, seeing is believing. 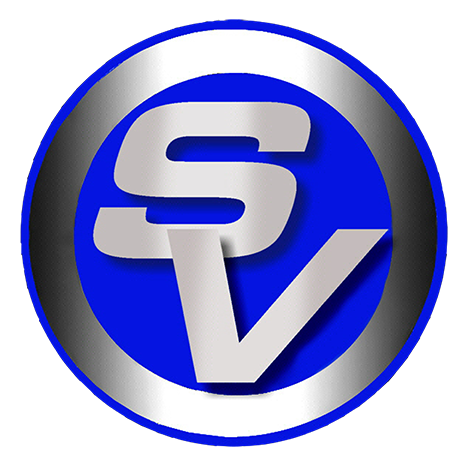 SV - What’s on your wish list?